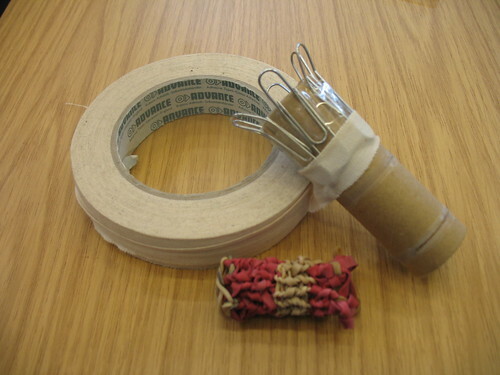 Basically, one began looking at the Klutz Spool Knitting kit that was lying around, and I said I’d teach her, on the spool from the kit, and her friend asked to learn too, so I took off the elastic band project I began a few weeks ago so I could give her the spool I’d made then. 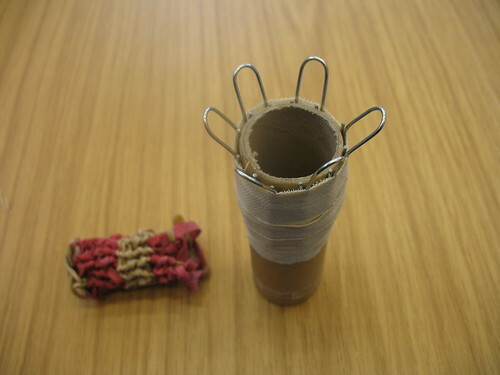 And five or ten minutes after the third girl came in and asked to learn too, so she unwound some address labels from their cardboard tube, and then came back an hour or two later, after I’d made another spool for her. I took some pictures as I went, so I could show you how I make these spools, which come out much stronger than any others I’ve made. 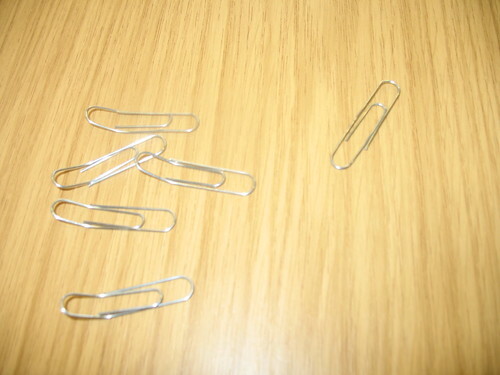 Besides the tube, one needs about six large paperclips, which can be bent by hand against the table. 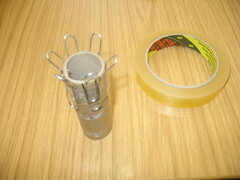 I use normal sticky tape to get the hooks in place. 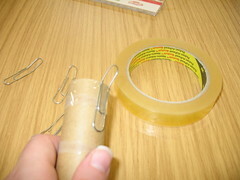 And then cloth tape (for repairing books) to actually hold the paperclips in place. Beyond that fun, my Perkins Brailler arrived today, although I didn’t get to really look at it (hopefully I will tomorrow) and won’t get to show it to you, or even play with it much, until I can bring it home next week. I’m up to lesson 13 of the RNIB Braille Primer, working on graph paper, so hopefully I’ll be able to pick up the use of the machine quickly and keep progressing. Plus two more books read. This has been a pretty good day! The current discussions of Burma (because of the trouble getting aid from outside into the country, let alone to the actual victims of the cyclone) inspired me to finally actually read this, and I’m glad I did, as I learned a lot about the Lady, as she is called in some chapters of this book, and the country she is from. I had known that Burma/Myanmar is a very (self-)isolated and brutal dictatorship, and that Aung San Suu Kyi, as leader of the opposition movement seeking democratic government in the country, has spent many years under house arrest, but I didn’t really know any more than that, so I was glad to learn more. This series is about the recipients of the Nobel Peace Prize, and gives lots of background about both the person and the situation they work(ed) in, and I’ve found all of them that I’ve read quite enthralling. I’ll get over all these series sometime soon, but they are very useful, and in many cases informative and interesting too. This looks to be a good one, with clear and cohesive numbered paragraphs that can be read either in order or at random. There is general information about penguins, but also plenty of space given to the varieties of them. I hadn’t realised there were quite so many, myself. Day 12 of the Omer. Shabbos is in an hour, my laptop is playing up, and I have burnt fingers, so this will be short. 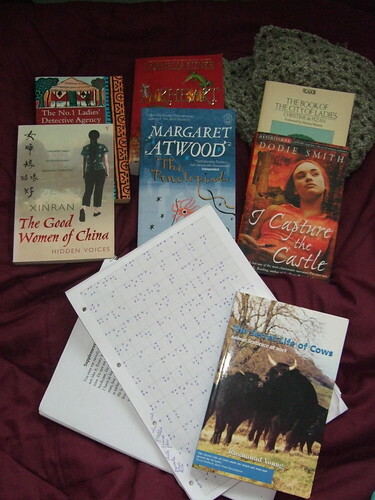 The bottom book in the picture is the one I finished rereading today, which is just lovely, and very interesting indeed. 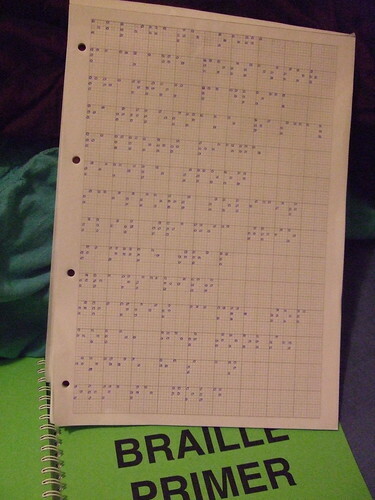 Beside it is my completed exercise 4 and the Braille Primer – I now know the most basic word contractions! – in the top right is the granny square blanket so far as I’d got last night, and the six books I got in a two-for-one deal at the charity shop (they didn’t have any yarn in). The two books on the left I’ve heard bits of on the radio, the two in the middle I’ve heard commendations of, the Dodie Smith one I’ve had my eye out for, and the Christine de Pisan, well, that brings me straight back to my teen years when I discovered and did a major project on her for school. This account of several of the cows from the Youngs’ farm is well put together and a wonderful read, more convincing as to how intelligent and loving cattle, and indeed many of the other farm animals, can be, by its friendly style than it might be were it to evangelise.